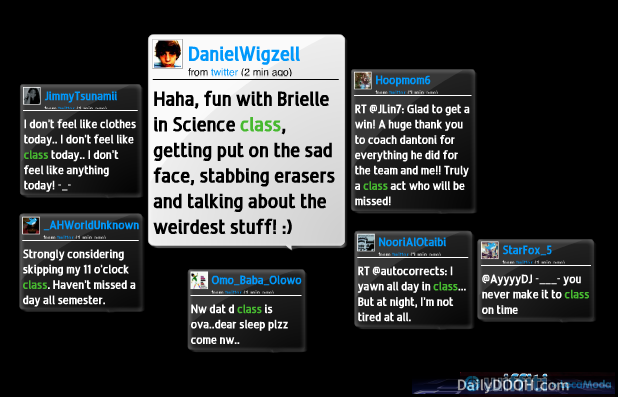 LocaModa are well known for the their Wiffiti real-time messaging platform, which can display social messaging aggregated from various sources, such as Twitter and SMS text messages. Recently, an unexpected surge in users creating wiffiti message boards (100,000 of them, apparently) led to the discovery that lots of people have started using wiffiti in the education sector, which isn’t LocaModa’s natural core market. These are teachers and other educators that have encouraged students to engage in classroom sessions by using their phones, and make classes more interactive and stimulating. Interestingly Stephen Randall, LocaModa’s CEO, told us it was also found that in some cases because of a level of anonymity among the user messages, normally shy kids have been engaging and participating much more, rather than before when they were reluctant to contribute in a group situation. LocaModa are responding to all this by offering a beta program for the education market, and tailoring the services and features available. They have had a high level of feedback which has helped them shape and test the offering. One of the versions is expected to be available for just under $10 per month for genuine educational establishments. Previously, their moderation tools were only found in enterprise versions of the service, but are now to be included in the education versions. Stephen also mentioned that he was surprised to find out (but of course delighted) that the wiffiti service had actually been included in several classroom text books that he had seen. You can go to the wiffiti site to sign up. In other LocaModa news, they have announced partnerships with the Miami Heat and the New York Knicks basketball teams. The teams have licensed the LocaModa enterprise technology which has allowed them to replace just Text-to-screen with Twitter as well at games and events. Adding diverse social media streams as well as texts means that engagement with fans can be much better than with the more traditional text messaging, which has mostly just been restricted to the live event itself in the past. We’ve also learnt that New York’s Madison Square Gardens is using LocaModa’s technology, and it’s looking to increase the number of screens deployed in the venue from 300 to over 1,000. In a recent game there, over 42,000 messages were generated by the fans, who could see a mixture of tweets, photos and emails on the screens. The service works by adding Flash-based intelligent content items to an existing playlist. The action script contained in the Flash files at the player level handle authentication and communication to the LocaModa service, and allows web-based control panel curation and moderation tools to be used. This allows for subtleties like brand name replacement in messages, as well as the more obvious need for profanity blocking. We don’t doubt that the moderators controlling the messaging displayed on the screens to fans will have aching fingers once a game is done. This entry was posted on Friday, March 16th, 2012 at 07:51 @368 and is filed under DailyDOOH Update. You can follow any responses to this entry through the RSS 2.0 feed. You can leave a response, or trackback from your own site.